IBM Cloudant Local is a database management system (DBMS) that runs across a cluster of servers to power mobile, web, and Internet of Things (IoT) applications. Cloudant Local packages up the always-on technology of Cloudant with streamlined DBaaS operations tooling and all the institutional knowledge that Cloudant developer-operators have acquired over the years to put the power of DBaaS in the privacy of your own data centers. As your business grows, Cloudant Local makes it easy to scale database infrastructure along with it - without sacrificing control or performance. Leverage the elastic scalability of Cloudant in the privacy of your own data center and manage it yourself. Or, spread your data across a mix of private and public clouds to maximize benefits of both. Cloudant Local lets you scale data on-demand, with the ability to span multiple data centers or cloud providers. Handle massively concurrent low-latency reads and writes without losing performance. Cloudant Local automates distribution and synchronization so you can push data closer to users for faster access. Unlike RBMS, in Cloudant, all copies of your data are available for reads and writes. Modern apps manage "unstructured" data that does not fit well in tabular rows and columns in a RDBMS. 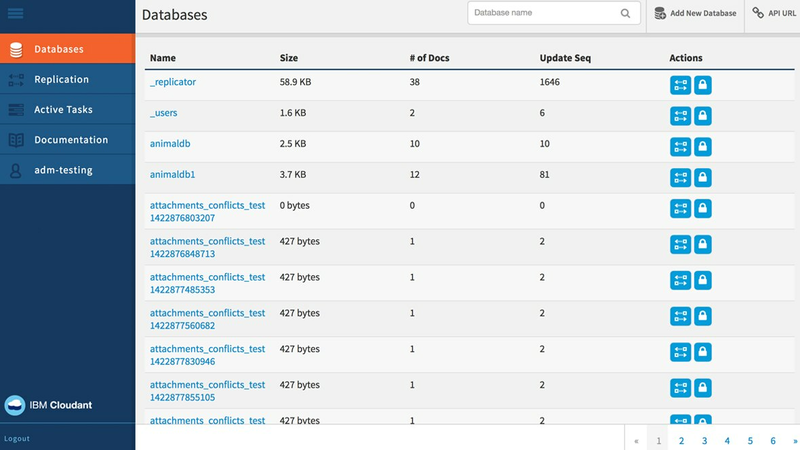 Cloudant's flexible NoSQL layer stores JSON docs, and is adaptable to rapid data model changes.